We’re proud to introduce you to our Organic Sprouted Whole Wheat breads. 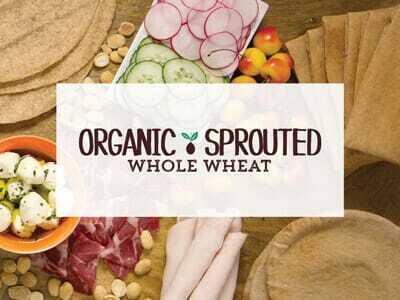 Now you can enjoy the delicious, deep, rich taste of our Organic Sprouted Whole Wheat available in Pita, Wraps, and Smart Pockets™ and all certified Organic by the USDA. We found these (Toufayan Organic Sprouted Whole Wheat Pita Pockets) a few weeks ago at our grocery store. We use them as a pizza crust. They are wonderful and just the right number of carbs for my type 1 husband. The best part – we get to have pizza whenever we want!!!! That’s great! We’d love to hear about your recipe. It looks like you are starting to label your vegan products, which is great. But can you please send me a list of your vegan products that are not labeled yet? My family and I are vegan and it will be very helpful for us when we are at the grocery store. Currently we have Vegan certification for our Gluten-Free Pita Chips. Our line of Organic Sprouted Whole Wheat Products are made with vegan ingredients. Also, our Organic Naan products are made with only vegan ingredients. Certain ingredients, such as Sodium Stearoyl Lactylate (SSL), are harder to certify as vegan. These ingredients are produced from microbial fermentation and can be derived from plant or animal sources. While we strive to ensure our ingredients are derived from plant sources, the existence of animal-based sources for this ingredient often classifies the ingredient as ‘possibly non-vegan’. For this reason, we avoid labeling the products as vegan. However, we invite you to make your own choice about SSLs and similar ingredients. Thanks for your interest and please feel free to comment further or ask any questions. I do not see this product listed as vegan. But all of the ingredients look vegan to me. Is it a vegan product? If not, can you let me know which ingredient is made with animal products? Our Organic Sprouted Whole Wheat products aren’t yet certified vegan, however, we don’t use any non-vegan ingredients. Ingredients: Whole wheat flour, water, organic sprouted whole wheat flour, yeast, wheat gluten, cultured wheat flour, organic honey, vinegar, salt, wheat starch. Ingredients: Organic wheat flour, water, organic sprouted whole wheat flour, organic sunflower oil, contains 2% or less of the following: salt, sodium acid pyrophosphate, organic sugar, sodium bicarbonate, sunflower lecithin, yeast, organic cultured wheat flour, organic vinegar. Enjoy! Please feel free to share any comments or questions. how do you store the smart pockets after you open them? We use the resealable closure, making sure to remove as much air from the package as possible. You can also use a resealable storage bag. We recommend you keep them in a cool dry place, room temperature is usually fine. Avoid storing bread on top of the refrigerator, because that area is usually warmer than the rest of your kitchen. Some people prefer to store bread in the fridge. That’s fine, just make sure that the bag is very well-sealed – any air inside will cause condensation and will dry out your Smart pockets. If you do keep it chilled, we recommend a short spin in the microwave before serving. It is okay to freeze bread, just be sure that the bag is perfectly sealed with little or no air inside. It is best to freeze things that are already chilled, to ensure even temperature changes. Defrost overnight in the refrigerator and use within three days of defrosting. Breads can be kept frozen safely for up to 3 months. Ingredients: Organic whole wheat flour, water, organic sprouted whole wheat flour, organic wheat gluten, organic yeast, contains 2% or less of the following: organic wheat flour, fermented wheat flour, organic vinegar, salt, organic honey, organic vinegar, wheat starch. Our Organic Sprouted Whole Wheat Pitas are made on equipment that doesn’t process anything else. Organic Sprouted Whole Wheat Wraps are also made on dedicated equipment. Toufayan Organic Sprouted Whole Wheat Smart Pockets are processed on equipment that also processes sesame seeds. Why does the first ingredient not have organic in front of it? Why doesn’t the wheat gluten and wheat starch also not have organic in front of it? Are ALL of the ingredients actually organic, or is it only the sprouted whole wheat flour and honey? Sorry for the confusion, the above post wasn’t comprehensive – we have corrected it. Please take a look again and let us know if you have any other questions. Are all these items yeast-free and strictly GMO-free? Hello Lawrence and thank you for your interest. All of our Organic Sprouted Whole Wheat products are made with yeast. They are certified organic by the USDA. We have not yet received Non-GMO certifications on these products. Please try them out and let us know what you think about them. Chinese chicken salad in a wrap. A fresh, healthy taste and a satisfying light meal. Spice it up a little by adding freshly ground mustard seed to the sauce before combining. Click here for a video tutorial!